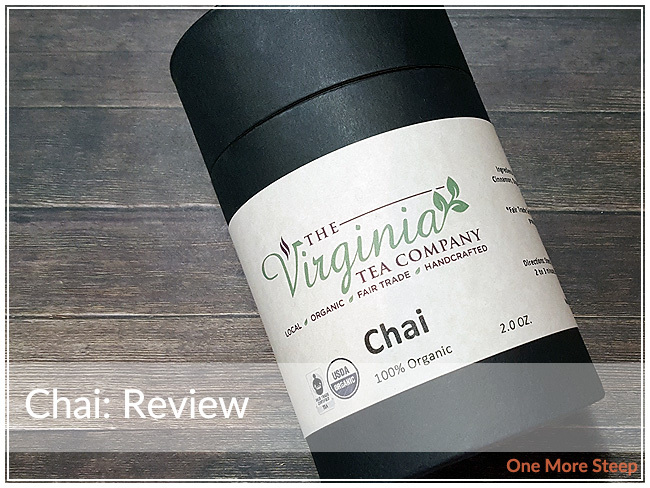 The Virginia Tea Company has provided me with Chai for the purposes of providing an honest review. I received this product at no charge to me and received no other compensation. Without a doubt, I am a fan of The Virginia Tea Company’s choice of packaging. The card stock carton is nice in that when I’m done with the tea inside, I can put it into recycling (or reuse it for something else). As with Earl Grey and English Breakfast, Chai came with empty tea bags, a wooden spoon, and a tea infuser ball (I had a photo of these with my first review of The Virginia Tea Company’s teas – Earl Grey). Again, the loose tea came in a waxed paper bag, so as soon as I opened the carton I could smell the tea. The most prominent aromas in this tea come from the cinnamon, ginger, and cardamom. 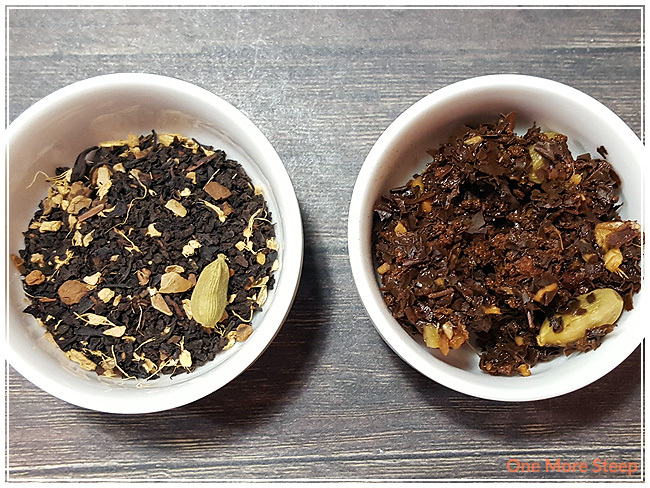 Like the other two teas I’ve reviewed for The Virginia Tea Company so far, the $11.50 option is just the loose leaf tea, while the $15.00 option has the tea with all the accessories needed for any new tea enthusiast (or as a gift option!). As per the packaging and their website, Chai is an “award winning organic blend”. 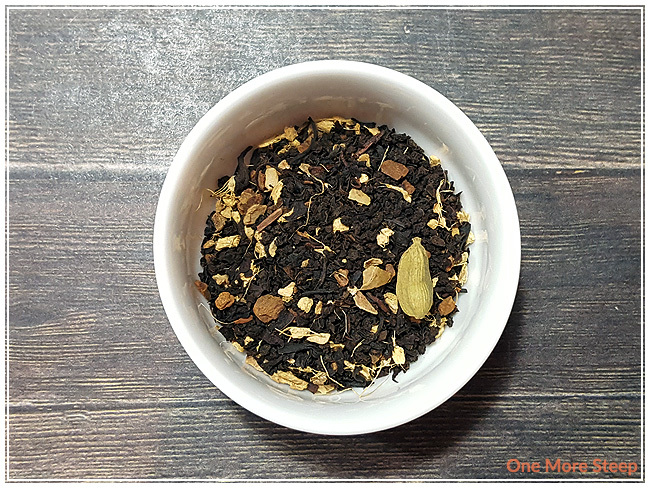 The ingredients in Chai are: fair trade organic black tea, organic cinnamon, organic ginger, organic cardamom, and organic vanilla. I can’t really make out the vanilla in the dry leaf, but I can definitely make out the other ingredients in the aroma of the dry leaf and it has me excited. I’m generally a fan of Chai in general and the Chai latte at Starbucks is my go-to drink there when I’m not in the mood for something cold. It took me an embarrassingly long time to learn that ‘chai’ is another word for tea so when I went to Starbucks to order a Chai tea latte, I was essentially saying tea tea latte – can’t take me out anywhere! The Virginia Tea Company suggests steeping Chai for 2-3 minutes in boiling water, and that it can be resteeped an additional two times. 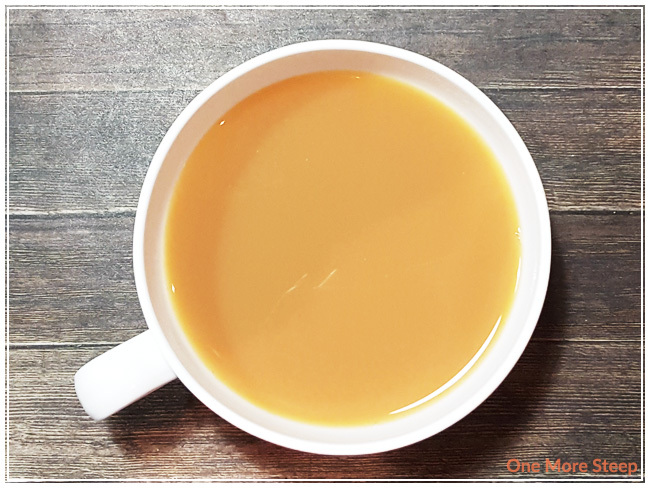 I used my trusty Breville IQ Kettle’s black tea setting (100°C/212°F) for getting my water to the right temperature and my initial steep of Chai was for 2 minutes (click for my review of the Breville IQ Kettle). Chai has a beautiful deep orange colour after steeping for two minutes. The aroma of the tea is like an amplified version of the dry leaf – I can make out the ginger and cinnamon the most. The taste of Chai has a nice warming sensation to it, which I contribute primarily to the ginger in the tea. The cardamom is a little bit lost, but the cinnamon and ginger are the stars in the first steep. The vanilla flavour is there at the end of each sip, but it can be a bit hard to taste from time to time. Because I do love my Chai as a latte, I added a bit of sugar and milk to it just to see how it would taste – I think it tastes perfect. The milk adds a layer of creaminess, but the warming sensation that the ginger provides is barely toned down so it’s still very much present. I resteeped Chai a total of three times (so four steeps overall). The second steep had the strongest ginger and cardamom flavour – it has a strong spice flavour profile than the first steep, and overall this steep was my favourite. The third steep was very similar to the first, a nice milder version of the second steep. The fourth steep was a bit watery, so The Virginia Tea Company was right on the button when it said to resteep two times. I loved The Virginia Tea Company’s Chai. I love the flavours of all the ingredients that are in this tea blend. While I didn’t taste the vanilla too much, I don’t think it was really all that needed given the fact that it was competing with some very strong flavours – cinnamon and ginger. 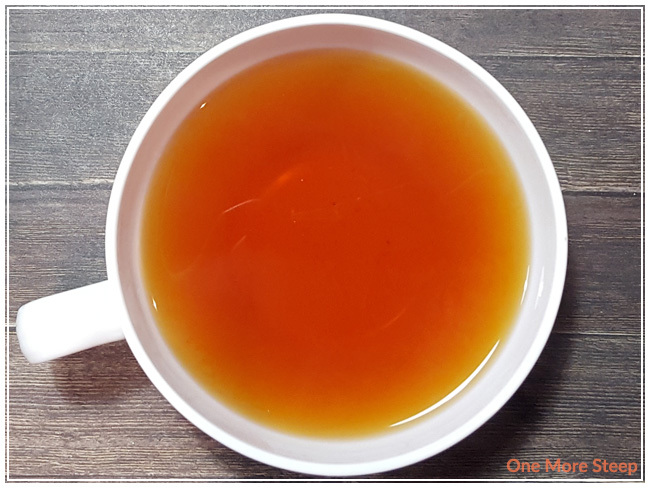 The warming sensation of the ginger is quite nice in this black tea blend, and I really enjoy Chai with some milk and sugar (although it doesn’t need the sugar like some other teas do). I made this one with water, as that’s how the steeping instructions went, but I think it would be really good as a proper latte (with a mound of foam on top) or even prepared steeped in milk. If you’re looking for a tutorial on how to make lattes at home without fancy equipment, I’ve got you covered.